Mayor Todd Wodraska was elected in 2016 in his hometown after serving as a Town Councilor since 2004. He was raised in Jupiter where he boated along the Loxahatchee River, and attended Jupiter elementary, middle and high schools. He fondly recalls the Town when Indiantown Road was just two lanes and I-95 did not extend north of PGA Boulevard. In his professional life, Mr. Wodraska is the President of Special District Services, Inc., a local business that creates and manages public/private partnerships. He has worked as a bond trader on Wall Street and as a consultant on the Everglades Restoration project. 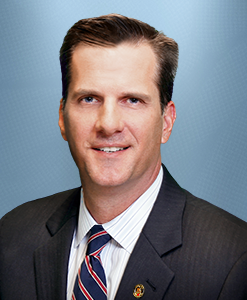 Todd earned his bachelor's degree in finance from Florida State University and his MBA from Rice University. He and his wife Tracy, a former Jupiter Police officer, have two sons, Jackson and Tanner. His main goal is to proactively preserve the unique, wonderful quality of life Jupiter offers its families and businesses.